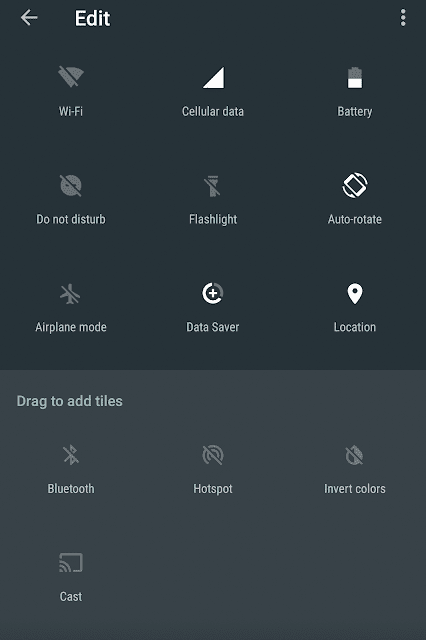 Android Nougat comes with a built-in feature that allows you to modify the tiles or items that are present in the quick settings drawer. This drawer is accessible by dragging twice from the top or using two fingers to drag the notification region. The tiles in this area can be sorted, removed and new ones can be added. Previously in Android Marshmallow, you could do it but with the help of System UI Tuner. Now, the feature is natively available without any digging. You must have noticed it already. Pull up the settings from the top. A mini-setting comes up first so pull it down twice. You can simply long press and drag the tiles to add or remove them. Drag them toward the top to add them and drag them and put them in the bottom region to remove them. You can also sort the tiles using the same method. If you put more than 9 tiles then, you will have two pages of quick settings which you can swap through by sliding your finger toward the left on the quick settings menu. While we are on the subject, you must have noticed a Data Saver setting there. It’s a new thing introduced in Android Nougat and is useful to prevent apps from using background data. Tap it once, see it light up and you will know that data saver mode is on. When this mode is on, only the app on the foreground will be given access to your precious mobile data. The ones in the background cannot connect to the internet and download stuff. They will be restricted from spending your limited GBs. If you long press the data saver quick setting tile and tap on data saver option or go to Android Settings > Data Usage > Data saver, you can see an option that says Unrestricted data access. Tap on it and a list of all your applications are displayed. Scroll through them and drag the slider next to them toward the right to give any application unrestricted access to mobile data. It will override the data saver mode and give the special app all the access it needs to connect to the internet.